This article is about the boss character in the Mario Party series. For the large Blooper in Super Paper Mario, see Big Blooper. For the large Blooper in Paper Mario, see Super Blooper (boss). Mega Blooper is a boss fought in the Mario Party games. In Mario Party 10, its first appearance, it is fought at the end, in a castle, of Whimsical Waters in the minigame Mega Blooper's Bubble Battle. Mega Blooper causes bubbles to rise, and these bubbles contain half a picture. In the bottom of the screen, a static picture or more shows the other half. Players must choose the correct half in a bubble to deal damage to Mega Blooper and earn a point. Mega Blooper can disrupt the fight by splashing ink on the screen. At half health, it becomes enraged. It can swim rapidly in a circle to make bubbles more confusing and harder to hit while also spawning Bloopers to attack players that have matched their cards incorrectly. 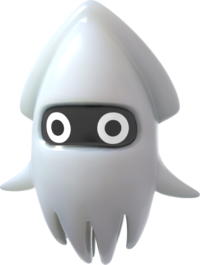 The player who deals the final hit to Mega Blooper earns an additional five points and defeats Mega Blooper. Mega Blooper reappears in Mario Party: Star Rush again as a boss. Players engage it in any board and at any time, provided they land on the boss space. Mega Blooper is a less aggressive boss in its minigame, Mega Blooper's Bayside Bop. Instead, it plays as a role of a conductor. It summons Bloopers depending on the amount of players participating and it throws a beach ball. The Bloopers hit the beach ball in specific rhythm. The Mega Blooper then throws another beach ball. To earn points, players then have to time hitting these beach balls the same way the Bloopers have done. After they are done, the players randomly shift positions. In the second half of the minigame, the Mega Blooper increases the tempo. The player that deals the last hit to empty the meter earns an additional three points. After the minigame is finished, Mega Blooper finishes conducting and leaves. Mega Blooper reappears in Super Mario Party as a non-playable character. Mega Blooper may have appeared earlier in Mario Party 9 in another boss minigame, Blooper Barrage. Despite playing a similar role and having a similar giant appearance, this Blooper is plainly named. This page was last edited on November 11, 2018, at 16:25.